Naturally cultured, live yeast cells grown in an oxygen rich environment, contains a host of live enzymes, B vitamins, minerals, amino acids and antioxidants. supplied as an alternative to Zell Immunocomplex for those with acute sensitivities. Zell Oxygen is a product with many years of successful clinical use. Naturally cultured, live young saccharamyces cerevisale yeast cells grown in an oxygen rich environment, contains a host of live enzymes, B vitamins, minerals, amino acids and antioxidants. A more balanced approach than oxygen therapy and in almost all cases an essential part of your regenerative programme. NADH is complimentary to Zell Oxygen, but can also be used in it's place if required; for a less broad spectrum effect. More economical but still a very good cell energy provider. Other Ingredients: Whole yeast cells, (saccharomyces cerevisiae), apple juice, lemon juice, grapefruit juice, wheat germ oil. Amino acids: alanine, arginine, aspartic acid, cystine, glutamic acid, glycine, histidine, isoleucine, leucine, lysine, methionine, phenylalanine, proline, serine, threonine, thyrosine, tryptophan, valine. Enzymes: hydrolases: esterases, proteases, carbohydrates, nuleases, glyoxalases. Transferases: transaminases, transphosphorylases, transacetylases, transglucodidases. Oxidases: dehydrogenases, oxydases. Demolases: aldolases, decarboxylases. Zell Oxygen® is a concentrate, 20 – 30 ml per day diluted in a beverage of your choice during or after a meal in one time or divided during the day. We recommend the intake with apple or grape juice. Zell Oxygen is primarily supplied as an alternative to Zell Immunocomplex for those with acute sensitivities, such as ME sufferers. For these types we recommend starting with Zell Oxygen, and once adapted, moving onto Zell Immunocomplex as soon as possible. For those not subject to these accute sensitivities we would always recommend Zell Immunocomplex from the outset. Zell Oxygen can justly be described as an essential supplement. A more balanced and fundamental approach than oxygen therapy, and in almost all cases an key part of a regenerative programme. Zell Oxygen has many years of successful clinical use behind it; it is the ultimate ‘food-state’ nutrient package. There are so many different types of nutrients, (as there are with any ‘superfood’), that it is unlikely they will all be identified. Due to its specific enzymes it compliments a full spectrum of natural vitamin and mineral formulations as recommended in the Core Regime. The tremendous effectiveness of Zell Oxygen is partly due to the fact that all the nutrients are incorporated into the living yeast cell. During the fermentation process, a nutrient base is provided that is food for the developing and multiplying special yeast cells. The nutrients from the feed mixture are assimilated and converted into the living structure of the yeast cells; the nutrients are therefore pre-digested and contain many ‘live’ enzymes. Living cells have been shown to emit coherent light energy - this light has many benefits when consumed and is thought to aid cellular communication. When Zell Oxygen is consumed, the thin walled, baby yeast cells pass easily through the intestine and the components break open, to provide the ideal food for all our cells. Most of us are starved of oxygen, not because of low blood oxygen levels, but due to inadequacy of cell respiration; this in turn has been found to be due to poor mitochondrial structure and function. The mitochondria are rod like structures contained within every cell in the body. They have been aptly described as biological spark plugs. They act to trigger cellular activity, this includes respiration, and in turn, aiding cell nutrient uptake. When the mitochondria are functioning properly there will be activation of overall energy of the body, a strong active immune system and a good ability to heal/replace damaged cells and organs. This process is a corner stone of health. As we age the mitochondria get ‘lazy’. They can also be damaged by chemicals, pesticides, vaccinations and genetic defects. Because of this damage all kinds of illnesses have become prevalent such as fatigue, M.E., Cancer, mature Diabetes, MS, Parkinson's, weakness of muscles, especially of the heart (including heart failure). Almost all of our bodily functions are hindered by damage and under-functioning to this vital part of our cells and rob our organs of energy, giving rise to an increasingly lowered immune system as well as increasing the chances of the development of all chronic disease. The daily consumption of Zell Oxygen is the best support for detoxification processes in the body with a minimum of unpleasant symptoms. In the short term this can be experienced with acute infection such as influenza. One can feel quite a lot better with the consumption of ‘natural’ anti-virals such as Colloidal Silver or Olive Leaf, eliminating the invading and multiplying micro-organism; however full vitality and feeling of well-being may not return straight away. By taking a high level of Zell Oxygen at this point such as 50ml 2 or 3 times a day for up to 3 days, one can often recover the feeling of well-being, often within hours. Detoxification, (without feeling worse as other methods of detoxification often leave us feeling for periods of time), is facilitated alongside general energy and well-being. 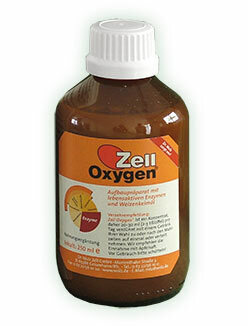 So Zell Oxygen may be understood as a prime aid to get to the ‘heart’ of the detoxification process. However, if one wishes to take detoxification further, other remedies such as Barley Grass Juice Powder will work in other areas and provide deeper detoxification when you are ready. Zell Oxygen is helpful in the reduction of Candida type symptoms, due to the action of the special live yeast cells. This may surprise some of you, as we tend to associate Candida with excess yeast. However, Zell Oxygen contains live saccharomyces cerevisaie yeast that is aerobic, as opposed to Candida that is oxygen ‘hating’. The zell yeast will take over the terrain where Candida is resident, forcing this more primitive life form out of existence, and at the same time the improved cellular respiration and immune system will complete the work in re-balancing the inner terrain. Zell Oxygen it is manufactured in a unique way, by Dr Wolz of Germany. He devised a special cold process, which enabled him to preserve the valuable enzymes inside the yeast cells. In each 30ml dose there are 150 billion bio-chemically active yeast cells. They are easily and quickly taken up by the small intestines, due to the thin walls of the yeast cells. Research undertaken in Utrecht, Holland, at The Institute of Molecular Cell Biology, proved that the thin walled yeast cells would have an immediate restorative effect on human cells. Rich in all B Vitamins as well as A, E, D, K, beta carotene, minerals, trace elements, and amino acids such as Methione, Gluthathione and Cysteine. Followed by Co-enzyme A and Co-enzyme Q 10 plus a number of other enzymes. Zell Oxygen has been used in competitive sports where sustenance was called for with much success. Zell Oxygen is able to absorb the free radicals produced by such efforts of extreme endurance. It is also given to horses to increase their chances of winning races. The action of Zell Oxygen, as stated, is to improve cell respiration - a superior method of ‘oxygen’ therapy, in the sense that taking oxygen supplements will drive the system in a positive voltage direction tending to create stress, and oxidative challenge (free-radical stress). Other oxygen supplements can lead to anxiety and insomnia for those with a weak nervous system. Zell Oxygen, on the contrary is healing for the nervous system; it is essential for treating chronic fatigue and nervous and mental disorders, as the cause of low oxygen is dealt with rather than loading the blood with un-natural amounts. Further information in the form of this complimentary book about Zell Oxygen is available on request. In this short book, he discusses the studies clearly showing that the yeast saccharomyces cervisiae (as contained in Zell Oxygen), has a powerful inhibitory and elimination effect on Candida Albicans. It also discusses the reason why Zell Oxygen is such a beneficial remedy against chronic fatigue syndrome (M.E.) and how this relates to faulty cellular respiration and lactic acid production of the cells and it’s correction by Zell Oxygen. Also discussed are misshaped red blood cells that cannot circulate properly into the smaller blood vessels can be corrected with Zell Oxygen. It should be noted that these factors occur in other auto-immune diseases. By improving cellular respiration, Zell Oxygen aids the strength of the immune system to a significant extent, (See also section on Beta-Glucans). This in turn has a highly beneficial effect in a number of areas, including acute and chronic infections. Most chronic health disorders have an unbalanced immune system as a major underlying cause (See the article Factors Involved In Auto-Immune Disorders here). In the vast majority of cases, there is a chronic infection(s) such as Candida Albicans overgrowth, Mycoplasma, various virus and bacteria, parasitic infections that help to maintain the disease state. Zell Oxygen helps the immune system to eliminate these chronic infections over a period of time, so indirectly bringing one into a better state of health. Other health problems specifically discussed in the book, and alleviated by Zell Oxygen are anxiety, neurosis, agoraphobia and cancer#. Page 29 in the book describes how Dr Paul Segar, one of the world’s most renowned cancer researchers, found that cellular respiration is damaged by toxins and this in turn leads to serious disease including cancer. Zell Oxygen contains all the antioxidant nutrients vitamins C,E, beta carotene, coenzyme Q10, selenium and especially L-cysteine, gluthione and co-enzyme. These help prevent mutational damage to DNA and are also anti-carcinogenic and free radical scavengers. Zell Oxygen also contains Krebs cycle subtracts and numerous redox substances such as gluthathione - a very important anti-oxidant. For many years, scientists have recognized the important of error accumulation in nuclear DNA, Mitochondrial DNA however has been virtually ignored despite the fact that each Mitochondria contains between two and 20 copies of the genome and there can be hundreds of Mitochondria in each cell. The spotlight is turning to the extreme susceptibility of Mitochondria DNA to undergo either spontaneous or free radical induced damage. The decline in the functional capacity of the cells with age, is now thought to be more due to the loss of Mitochondrial DNA. Zell Oxygen contain a synergistic blend of nutrients to help Mitochondrial DNA survival as well as DNA and RNA, to feed the Mitochondrial DNA. These are in relatively larger quantities than normally found in foods, but still at relatively low amounts compared with non-food state supplemental forms of these elements. This is desirable as the utilisation of these nutrients is far superior in this food state form. Are contained in Zell Oxygen at 200mg (900mg in Zell Immunocomplex) for each 30ml measure in addition to the wide range of other nutrients. Beta Glucans is a wonderful supplement; however the overall benefit to health restoration from Zell Oxygen is a result of the synergistic effect of all the ‘food-state nutrients’ it contains. The isolated yeast wall components designated as (1->3), (1->6)-ß-D-glycans, recently demonstrated to be one of the most effective activators of the immune system, are worthy of special emphasis. Oriental herbalists have known for centuries that something inside yeast and mushrooms has the ability to dramatically enhance your immune system. Scientists have discovered it is a long chain of polysaccharides called Beta Glucans. The real discovery came from the specific kind - Beta 1,3/1,6 Glucan, found in the cell wall of Yeast.